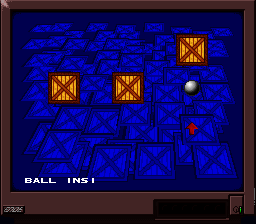 Corn Buster is an unreleased Breakout/Arkanoid clone by Engine Software. Oh no, not the corn! The ROM image of Corn Buster has been out for a long time (circa 2003), but for whatever reason I never made an article for it. The first time I heard about this game was on IRC, when someone gave me the ROM image. It turns out that Engine Software, the Netherlands based developer, posted the ROM image on their website. Unfortunately since they used frames on their site, Archive.org was unable to capture the original page, so we cannot find out exactly when it was posted (and my archives from that period are in an inaccessible crate where I can't load them). It was very generous of them to post the game, not many companies do that! Back in 2008, someone on the Lost Levels forum by the handle "The Man From P.O.O.T." was interested in Corn Buster, and asked the developers a bunch of questions. The full interview with Ruud Van De Moosdijk was later posted on Unseen64. Engine Software was in talks with Sunsoft for a worldwide release of the game. The game was cancelled because by the time it was finished, the Playstation was out and the Super NES was in decline. Of course, we all know the financial troubles that Sunsoft was having in the mid-90s (which led them to close down their American division), so this could have also contributed to the cancellation of this game. The game was designed by Ivo Wubbels and myself (both founders of the company and still in function) and was furthermore designed in detail by Arjen van Haren (no longer working here) and Marco Willemsen (Senior Artist). Development started around 1994 I guess…before we were officially a company and got Nintendo Licensed. It was our first professional game, and I remember we even wrote our own assembler for SNES on PC (SNASM) because we had no official tools. According to the interview, the game was about 70-80% complete. An unlicensed version of the game was published a couple of years ago by Piko Interactive, which fixes some of the incomplete aspects of the game. 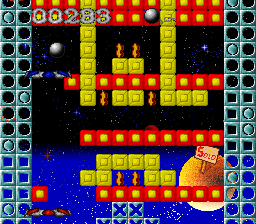 Corn Buster is like Breakout, but you advance upwards as you break away the upper part of the screen. 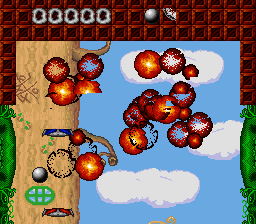 The game itself was inspired by an MSX2 game called Breaker rather than simply Breakout or Arkanoid. In fact, the gameplay is pretty much identical to Breaker. The prototype is in a debugging mode, which means if you do not shoot off the ball at the start, the screen just automatically scrolls upwards. If you go beyond the final goal, the game glitches out and freezes. 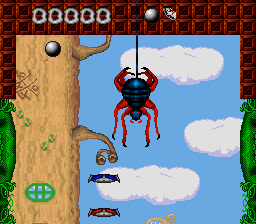 Much like Arkanoid, there are various power up (such as making the "bat" (paddle) wider or smaller). There are two bats on the screen as you play. In single player mode, you can move the top bat wherever you want, which makes the game far less tedious, while the other remains fixed at the bottom, following the left-right motion of the top bat. The ball moves really slowly, something that the developer himself admitted in the Unseen64 interview. Due to this, it can take a while to beat each level legitimately, they are very long! 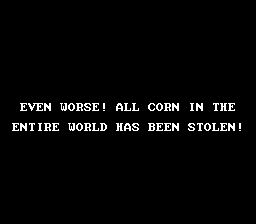 The premise of the game is that the world's supply of corn has been stolen, and it is up to the main character, Globey, to save the world. 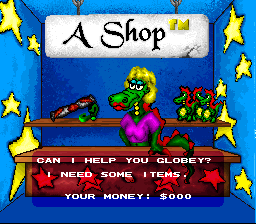 Globey is the "corn buster". Yeah, the story is pretty silly and nothing within the game really elaborates on this. Globey is the Engine Software mascot. 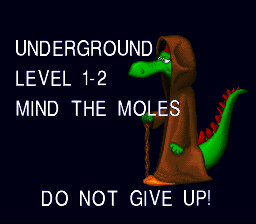 He was used in earlier MSX2 games (the first of which is called Dizzy) that they developed. 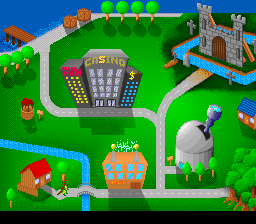 This game has a level map, where Globey walks around to various themed regions (forest, space, castle and casino). 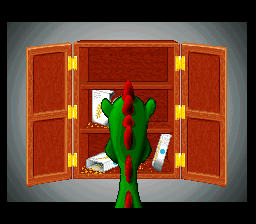 There is also a store where you can buy items and gamble the money you gain in the levels. You can buy upgrades to increase the size of the bat, and a cannon item that lets you shoot from the bottom bat. There also doesn't appear to be a save system in this game. Considering how long it takes to beat each level, it would be pretty tedious to play through them all in one go. If you beat all the levels in an area, there is a boss fight, which in general is super easy. At the dock, there is only a boss fight. Obviously this area is not really finished. Overall, this game is not too bad. I think the slow speed of the ball is really the biggest downside that prevents this from being a must-play. I would imagine that if this game was completed, this issue would have been addressed, along with the lack of a save system. Globey loves his "cerials". Obviously the game hasn't been gone over by a native English speaker yet at this stage of development. It is stolen! 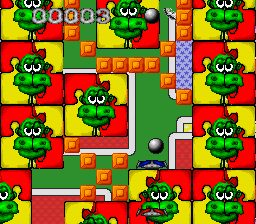 Map screen, all levels are accessible. The store, where you can buy items or gamble away your money. Little ball, little ball. Intro to the levels. 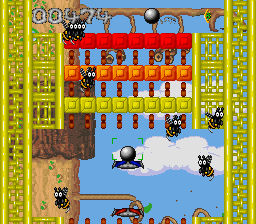 The game is in a debugging mode, so if you do not shoot the ball, the screen autoscrolls up, through obstacles. 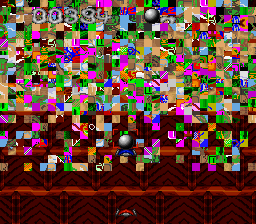 Go past the goal, though, and the game glitches out and freezes. 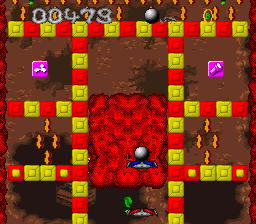 Space based level, showing off the larger bat powerup. There are enemies in some places, but they are nothing more than moving obstacles. Casino themed level. 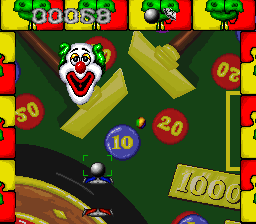 The end boss of the casino area is this clown. Spider boss at the dock. Beating the spider boss is pretty easy. Nothing happens afterwards, though.